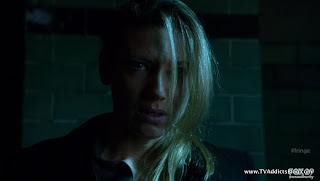 Have I mentioned to you guys how hooked I am on Fringe these days!? Okay, I know, I pretty much have mentioned it after every new episode has aired over the last couple years. But, WOW. Last night's episode was another fantastic progression of the story this season, as well as a solid individual case. And, I'm guessing if anyone watched the previews for next week they couldn't be more excited about what the show FINALLY is going to discuss at length. But, we'll get to that next week. This week we have to ponder what on earth was happening at the end of the episode!? (As well as everything that preceded it, duh.) So, let's not waste time and get into our usual dissection of yet another fantastic hour of television. This week featured a young man named Sean and his habit of overhearing a bunch of other people in his head. 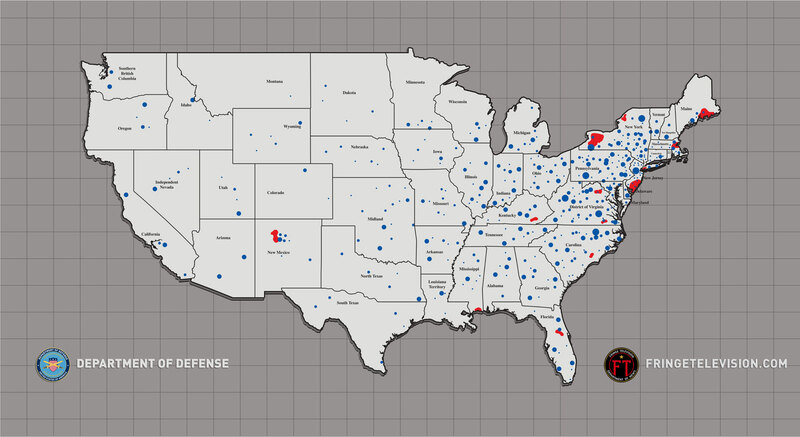 Lately, those people have been teaming up to protect some big secret. They killed a couple journalists that were about to out their secret and then they turned their attention to Olivia and Peter who were about to break the case wide open as well. The cause for his overhearing? Mental telepathy. A crazy doctor named Doctor Owen Frank decided he wanted to play God and make a "better human being". He went to prospective parents who were having trouble conceiving children and created babies via In Vitro. Of course, what no one knew was that they all carried the same paternal gene. Dr. Frank used his own DNA in trying to create this PERFECT HUMAN. The common genetical makeup in these "200" children is what caused the ability for these people to communicate through their minds. Walter used a swarm of BEES as an analogy. They all communicate through pheromones over miles to harvest honey. Anyway, Sean was misdiagnosed as a schizophrenic and our Fringe team took him off meds to allow him to help with the case. He started hearing many voices and couldn't make out what was going on. They weren't able to save Dr. Frank from his certain demise. But eventually, he figured out that they were coming for Olivia and Peter. Astrid made the call just in the nick of time to give them the upper hand. Sean was then able to hear silence for the first time in his life. It was unclear if this was because Dr. Frank was killed, but that would be my guess. So, all of this stuff with the brain sort of tied into what's happening to Olivia right now. But not really. She's getting a rush of memories, so that's still a little more tied to what happened in Westfield last week. But, a doctor trying to alter genetics for scientific gain and the reemergence of Cortexiphan to the story this week? Well, that has Walter written all over it. Let's analyze some Fringe Mythology folks! Glyph Code - HENRY - Oooooh. That's exciting! Henry, as we all know could be referring to 1 of 2 things. Either the Alternate Universe cab driver that allied himself with our Olivia last year in her attempt to get back to our universe. OR, it could be the child of Peter and Fauxlivia in which Cab Driver Henry delivered thereby having the child named after him. Obviously, they couldn't introduce such a storyline of this child and then erase him from existence, right? Surely, OUR Olivia needs to know about it first. But, could Henry's relevance to the story be more significant than that? Henry's blood/DNA was used to activate the machine OVER THERE prior to Peter getting in the machine OVER HERE and causing this whole "time distortion". Maybe it's all related somehow. Thanks as always to Fringepedia for the glyph code screenshot. Observer Spotted! 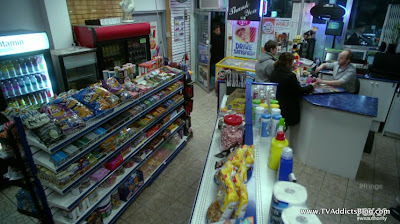 - At the convenience store when Peter goes in looking for Olivia, the Observer walks past the window outside. Hmm, perhaps just witnessing some important event like Olivia vanishing out of thin air!? 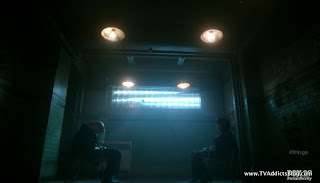 Walter talking to the patient in the mental institution. "And I told Tim, it's not what the LSD can do. It's wht the human mind can do which is truly wonderful" And when they told him the patient thought he was on some random planet out in the universe, Walter responded, "Lovely planet..."
Walter almost had a big theory on Olivia's influx of memories and Peter and Olivia listened attentively. Then he just forgot indicating he had taken one too many drugs of his own. Other than that, Walter has actually been pretty much on his game the past couple episodes. Not too crazy! Food of the Week - Was that tea with honey? 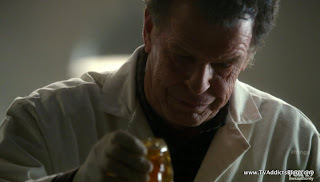 Or maybe some chemical concoction that he was putting honey into. Regardless, the honey that inspired him to come up with the bee analogy to this week's case was Walter's food choice! Olivia's Memories - So Olivia's infusion of memories that we saw last week wasn't a temporary thing. In fact, it just kept growing more and more as the episode went on. She showed no fear in getting these memories because it was like a revelation to her. She was finally "REMEMBERING" things especially her love for Peter. 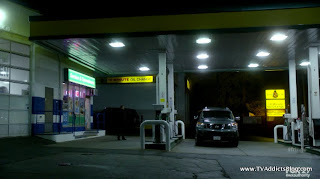 When Walter examined her he asked if she remembered getting him from St. Claire's alone. She said vaguely, as if it had been part of a dream. There was a moment where Olivia "DIDN'T" remember something and it had to do with a scar on Peter's hand. Peter said he got it a month ago which is why she wouldn't remember. By the way, we now know it's been 3 months since Peter arrived in this "timeline". Crazy! When Walter took a hair sample from Olivia he discovered traces of cortexiphan in her system. He and Lincoln took a trip to New York to "the bridge" to see Nina Sharp. Walter theorized that Olivia had been given cortexiphan recently and repeatedly. Nina claimed to have no idea what Walter was talking about (and based on that last scene, it's possible she didn't!) But we know that we saw Nina overseeing some injections to Olivia. We know that she prescribed some kind of drug to Olivia for her headaches too. Is it possible that Nina is just another pawn in this and Jones is pulling all of the strings? It was pretty cool to see Walter and Lincoln so adamant about getting Nina to bring them to the last remaining vials of cortexiphan. They even prevented her from calling ahead. When they got there it appeared that there were still 20 vials, but you know Walter. He decided to drink one of them! Yep, it had been replaced with Food Colored Potassium Iodide. We did not get to see Nina's reaction to this news to know if she would come clean or not or if she truly had no idea what they were talking about. Peter is definitely conflicted about this Olivia remembering everything and keep referring to Peter as the man who knows him completely and loves him, etc... Peter said he's definitely been thinking about it. It was nice to see him say that he's been through this before. He made the mistake of thinking Fauxlivia was Olivia (and got a Henry out of it, hello!?!). He betrayed the Olivia that he loves. But what he fears most is that when he looks in this Olivia's eyes, he knows that it's her. (Well, Peter, I have thought it was her all of this time!) And then BAM, they're kissing. Depending on how you think this story is progressing you could either be really relieved at this moment and happy OR you could be angry with Peter yet again for falling for the wrong Olivia. Or you could be rolling your eyes that all this LOVEY DOVEY stuff is getting in the way of pure sci-fi bliss. Me? As I always say, I like a little Romance with my Science! So after the big kiss, Olivia had the sudden urge to pee. (natural instinct, I would say) But did she ever get to that bathroom? Peter went in looking, the guy working in there never saw her. An Observer walked past the window. That woman is just gone! WHAAT?!?!?! Now, we have seen Peter vanish into thin air before. 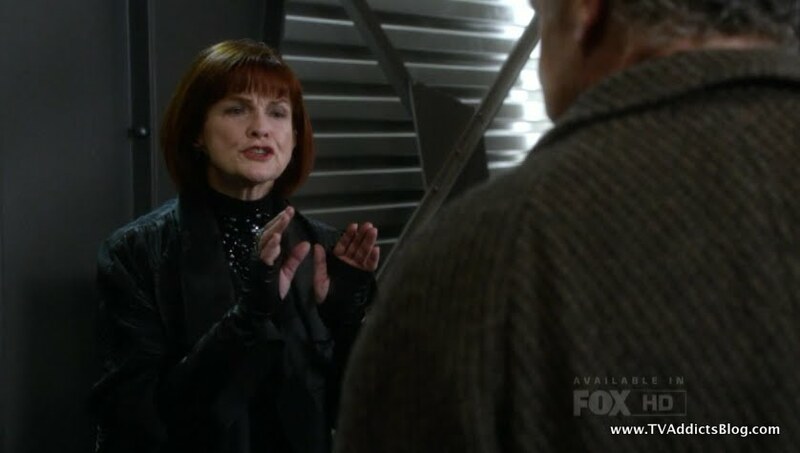 But this time, Peter does acknowledge that she's missing. What makes us even more confused is that we see Olivia wake up and chained to a chair. She seems really out of it. And who is staring at her and also chained to a chair? None other than Nina Sharp! She assures Olivia everything is going to be okay. I must point out that the outfit Nina is wearing is totally different than the one she was wearing with Walter and Lincoln in New York. It's tough to tell what Olivia was wearing as she had a coat all bundled up. Plus, all her suits look the same anyway. So what on earth is going on here!?!? I have a few theories and I'm sure most of them are wrong, but here goes! Ridiculous Theory 1: This whole season has been some kind of induced dream and David Robert Jones is somehow behind it. But he's dead, you say? Well, did we ever meet Jones's "OVER THERE" persona? I don't think we ever learned of his fate. Olivia was fed different memories and the drug was somehow wearing off and she got a rush of her real memories and then WOKE UP (so that was OUR TIMELINE at the end), having her disappear out of this "MATRIX LIKE" reality (the altered timeline). It might explain why Peter would disappear and then reappear as well. But, in all honesty, this is just my geek flag flying. I don't think any TV show would attempt at being that ridiculous. Theory 2: Olivia and Nina were truly kidnapped in this "altered timeline" that we've been watching all season. Maybe a little time has passed for Nina to change outfits and what not before getting captured. Of course, an alternate version of this theory is that Nina is just pretending to be a captive in order to fool Olivia. But how would she have gotten out of her current predicament with Lincoln and Walter? Theory 3: That WAS "our" timeline at the end and Olivia was having a dream about it, placing her consciousness into the Olivia in the revised timeline. (which caused a memory transfusion) Possibly the same thing happened to Nina which might explain why she had no idea what Lincoln and Walter were talking about and seemed shocked that the cortexiphan was gone. Of course, it wouldn't explain why she wasn't shocked to have 2 biological hands in this revised timeline. Theory 4: My theories are ridiculous and we should just wait until next week when it's cleared up! This is probably my favorite of the theories because it's probably the most accurate. My gut feeling is that the Olivia and Nina we saw at the end were OUR Olivia and Nina from our timeline/our universes. How that ties into what's been going on all season, I don't know. Because I still think what we've been seeing all season are still OUR characters. It's very confusing, and again not making much sense. 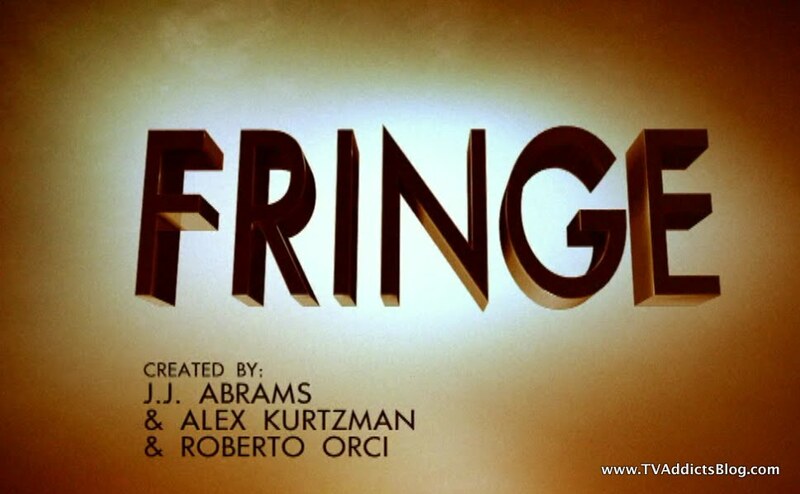 But I have faith that the FRINGE Gods (aka writers/producers) will make sense of it all for us! I know, you can say it. I've blown all your minds with my "awesome" theories! Or, hopefully, I at least gave you something to laugh at. In all seriousness, I'd love to hear your takes on what you may think is going on! But, we know this show normally answers questions quickly, so hopefully a resolution is coming soon. I'd love to talk about what's coming next week because it looks really awesome! But, I know how some people get when discussing previews for next week. So, I'll just send a link to the preview! By the way, you know how we had those crazy "different episodes" in season 2 and season 3. Season 2 was that "old time" episode "Brown Betty" and Season 3 was the "animated" episode "LSD". I read an interview somewhere that they already have something cooked up for episode 19 of this season. (LSD and Brown Betty were both episode 19 of their seasons) They said they will attempt to surprise us in some new way and feel we won't be disappointed. I'm excited! But definitely plenty of time before that, especially with the March Hiatus approaching. But, we have one more episode before that 3 week March Hiatus and it looks to be a doozy! (after the hiatus the remaining episodes will air uninterrupted) Hope you enjoyed my ramblings as always and I'll see you next week! WATCH NBC'S AWAKE NOW!! It will officially begin March 1st at 10pm. But you can already watch the pilot episode! It's available for free online, on iTunes, Hulu, Amazon Instant Video, and probably other On Demand services too! I was blown away by the pilot and recommend you watch! 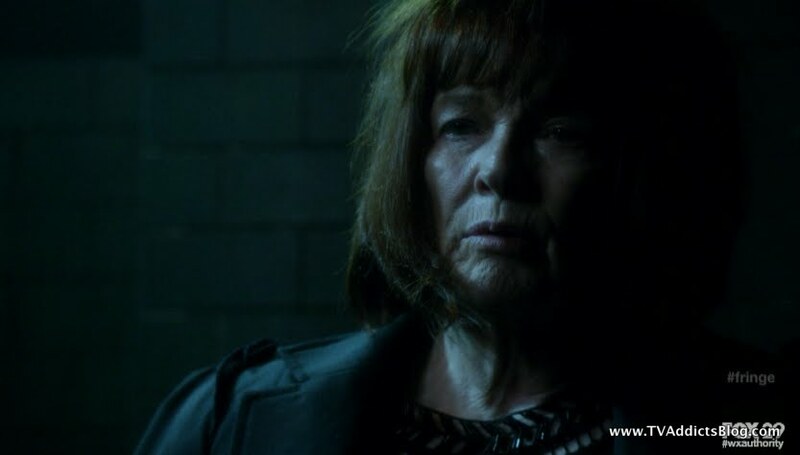 I'll post more later, but for now the only thing im positive of is that the Nina that was at Massive Dynamic with Lincoln and Walter is a shifter..
Yep, no other possible reason, Nina and Alterna Broyles were part of DRJ's shapeshifting army. And i guess you're right Mike, that this timeline/universe is the same one that we've seen before Peter vanished at S3. These writers were beyond awesome. Yeah I'm not sure how I didnt consider shapeshifters. Probably because the humans they shift into are usually dead. But we don't really know if that rule applies to these shifters! It's probably the case with Nina. So if we are in our own timeline does that mean jones is alterna jones? That certainly would explain his presence. Totally agree though. The writers are outstanding! Dynamite job as always, buddy. 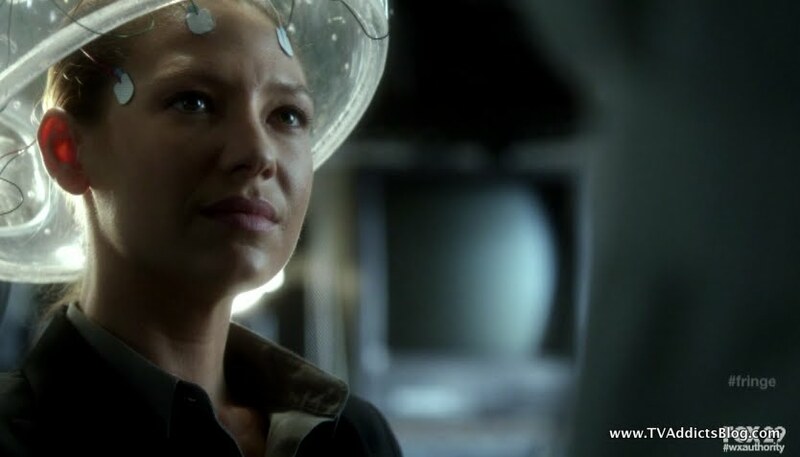 I'm thinking the observers are going to have some major play getting this "timeline" sorted out and my initial thoughts are that they are the ones that teleported Olivia being as they can move practically all over the place. Thanks curt! I agree the observers will be involved somehow and we probably won't have to wait long to find out how! Everyone, unless you want to remain completely spoiler free you might want to check out the outstanding extended preview of next week's ep! Outstanding trailer! OK, all can say with that ending is WTF? I give up guessing or making theories. Maybe the whole season has been taking place on the Hollodeck and Dr Moriarity is in control. I had always assumed the shape-shifters' "host" had to die as well. One thing about these writers, they never let we fans catch our breath, relax and just enjoy an episode. They always have to pull the rug out from under us every couple of episodes. Great episode though. If this show gets cancelled there is no justice left in tv land. Can't wait to see what's next. And totally hear you on if the show gets cancelled. Sometimes I like to believe that some shows get by on quality even when the viewers (in masses) didn't seem to be there for it. I think FOX and WB have a little soft spot for this show. It's why it got renewed for season 4. I just hope we can squeeze one more out. I know the producers were originally thinking 7 seasons, but 5 would be good at this point. As long as we get a good ending for a show that deserves it! Wow is right ! I also thought of shifters but also ws confused since they have always had to have that person be dead. But this is a new kind of shifter - so maybe the 'rules' don't apply. But aren't there 2 Ninas ? 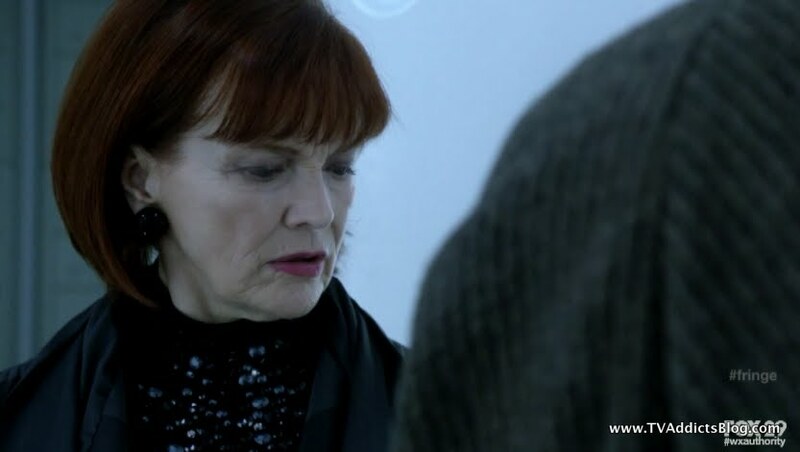 Maybe our Nina is in the basement and alta-Nina is the one with Walter and Linc. I can't remember - have they ever explained how they have a bridge between these 2 worlds when Peter died as a child in both versions of these worlds ? Even if the bridge was opened by him then he disappreared from everyone's conscineceness so they did not remember him - then how do they think the bridge came to be ? Seeing Nina with 2 hands was freaky ! WHich is what led me to the shifters. Strangely i had always wondered if alterna Nina had both her hands. I thought at first that Sean was controlling those 3 guys to kill the doctor. Can we assume that killing to doctor broke all the links for these boys though ? We might just be re-visiting this again I think. I normally don't watch the coming ups - but I just might have to this time. Good point on the 2 Ninas! We have never met Alt. Nina. So I guess there's a chance that Alt. Jones (whom we've also never met) and Alt. Nina are behind this whole thing...memory losses, 2.0 shifters and what not. That would be an interesting angle to take this. The whole thing about "how did the bridge get created" has been my #1 question that I've brought up in every recap this season. 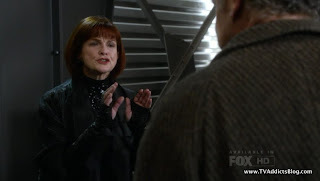 lol Last week they FINALLY touched on it with the machine still seeming to be "linked" to Peter somehow. this was further convincing for me that they're still in the same timeline...they just "don't remember".... I guess there's even a chance Walter is starting to remember too....that one thing i listed as a walterism may have been him coming to a possible realization about something but then he just said "i forget what I was going to say" or something. Nina with the 2 hands...I think we've seen that earlier this season too. Hmm...I wonder why Nina wouldn't have lost her hand either...she probably still would have chased down Walter who was going after Peter in the other universe in 1985 and lost her hand, right??? I'm liking this ALT Nina /Alt. Jones idea. As for Sean and the Doc...no we can't assume that he lost the link because the doc died....I guess we might be revisiting it but I just figured it was a one-off story. But the themes from the story may be revisited for sure. I suggest you watch the preview....I guess it may only set us up to be let down...but FRINGE rarely (if ever) has let me down...and it has me super psyched about this Friday. I want to just tell the whole world to forget if you've never seen an episode and watch this week! Anyway, enjoy the preview if you watch! Alcatraz: I'm posting here as I don't think anyone is looking at last week's alcatraz recap now. VERY interesting Q&A for the rest of the season. I did not pick up on 3 being important - did any one else ? Or 47 ? That's what I thought - that they have not answered the bridge and that it had been discussed here. I know it came up last week, but in a way that didn't really reveal anything. 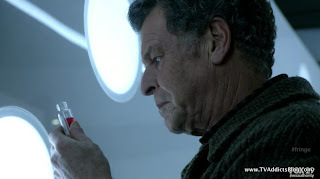 WHile trying to build the interface they discover it's set to Peter's DNA - but never really questioned it. Ok - so I watched the preview ! Holy crap ! I might have to watch this one live instead of 9:30 or 10pm. It helps that my Supernatural will be a repeat. Right, they addressed the issue but no one spoke of how the machine bridged the universes in this "timeline" either. I like their approach to what will be resolved this season vs. overall. Seems like we're on the right track with our questions/theories so far! HIMYM : If you haven't watched then save this for later. I'm happy Robin and Ted saw fit to NOT get back together. Loved how Barney was still in LI after the drunk train - this show is great opn little deets like that. Loved Barney being all non-chalant when told Robin and Kevin were over. She really hurt him I think. Return of the Blue French Horn was fun. The huge amt of yellow umbrellas at the end was too too funny. But I missed Conan at the bar. What did NOT amuse me was Marshall's 'not yet' at the end. Enough already - why leave that open. We all know Robin is not the mother, so just end it already and pay Lily that bet. Personally I don't want Robin and Barney together, I always felt she made him wussy. I want him to grow up and find love, but not be wussy. But I have a feeling they will wind up together. It occurs to me - robin could be the bride at the wedding this year if maybe she has some immigration issues and Barney marries her to help. "I know we should start with Alcatraz commentary but OMG on HIMYM last night! lol I'm ready to talk as soon as my meetings are over today. But, did anyone who watched catch the Conan O'brien "walk-on" part? It was hinted that it was coming but it was a blink and you miss it moment. My wife caught it (who is never looking at the TV instead of her phone lol)...so we rewound and it was most definitely him! Okay, cue up some Alcatraz commentary!" The whole "long term bets" thing had some flaws for me. Marshall seemed to be supportive of Robin and Barney back in the day. you'd think he might stand by the bet! But continuity errors like that don't bug me. lol I agree that Lily shouldn't be so cruel! But, I'd like to think when it mattered they would do the right thing. Good call on Barney being pretty hurt by Robin. I think he's still going to pursue the stripper girl for now so we're left to wonder who is at that altar! I touched on Marshall's "not yet" in my alcatraz post mentioned above. I'm okay with it from that perspective! Yellow umbrellas were great, blue horn locked awesome, conan at the bar was great. on FRIENDS, it was clear cut that Ross/Rachel would end up together. On this show, they've done a good job keeping us guessing. The clean way to go would be to pair up Barney and Robin, but I'm not so sure they're going to do it. We'll see! That's all I have for now! LOL on the rules - I keep confusing them. Im finally getting it that for Kelly, Leslie and I to talk Ringer/Revenge I have to use Alcataz so Kelly sees it. But you do make sense - keep the night the same. But poor Fringe gets short changed then. Def pursuing the stripper for awhile as I know the actress has multiple eps, and to keep us guessing. yeah - 'not yet' could be optimism, and a little refusal to let Lily win just yet. It's not that I hate Barney and Robin as a couple so much as it's just such an obvious thing to do. And this show is too good to be obvious in the end, so I hope they won't put them together. I have always seen Robin with a more man's man type of guy - neither of which any of the guys (Ted, Barney, Marshal) are. Lily even caused Ted and Robin's breakup accidentally too (or maybe intentionally now that we know about the bet). She suggested to each of them where do they see each other in 5 years. So yes, she is quite the meddler! It was Marshall's facial expression when he said "not yet" that he seemed pretty serious about it. Then again, he also was the one who told Robin to move out too. So who knows? I just can't see them revisiting Ted and Robin again. This chapter seemed pretty final for them. But you never know. Agreed...at this point Barney/Robin is definitely the obvious thing to do. I was fine with this on Friends and even hopeful that they did the obvious thing. But HIMYM isn't the same kind of show. That's why I made the comparison. These writers do a lot of trickery so we almost hope there to be a catch to Barney/Robin. I guess we'll see! Good point on the Fringe 3 week's off - guess I'll be posting HIMYM on a monday show afterall. Damn ! I forgot about dual citizenship too. Oh well. Some teases from the Fringe producers on Friday's ep and what's coming up after the hiatus.